This section overviews self generation of electricity, with consideration of thermal loads as appropriate to the generation technology. Utilities for a facility or campus can be classified as electric, thermal for space conditioning, thermal for process requirements, water, and sewer. The thermal classes comprise cooling as well as heating components. Choosing to supply a utility from a central production station arises from the expectation that economies of scale in equipment, real estate, labor, and operations from a central operation outweigh the inefficiencies of the distribution system and any required local converters. Electric, water, and sewer utilities are the classic examples of this approach on the regional scale. On the campus scale, central plants can provide similar advantages for the thermal utilities of chilled water, hot water, and steam. Another potential increment of efficiency in central plant operations can be extracted by the production of useful mechanical and thermal energy from the same fuel source, or cogeneration. Typically, mechanical energy is used to turn an electric generator, while the recovered thermal energy is used to generate steam and/or hot water. When there is a suitable need for one or more hot thermal utilities, in terms of both instantaneous demand and consumption over a period of time, cogeneration can be an economical option. This section begins with an overview of the regulatory enablers for self-generation. A discussion of the opportunities for electric energy generation follows. Cogeneration systems are emphasized, with supplementary information on photovoltaics and wind turbines. The section concludes with factors important for evaluating the financial aspects of a self-generation project. Electrification of the nation was accomplished in a heavily regulated utility environment where generation technologies and economies of scale promoted large central generating stations delivering power through a grid infrastructure. In that environment, utility connection policies discouraged non-utilities from installing small generation resources to provide a portion of their electricity needs. Over time, national legislation has been enacted mandating changes favorable to cogeneration and small generation. Key legislation included the Public Utility Regulatory Policies Act of 1978 (PURPA) which opened a market for electric power generation by non-utilities, and the Energy Policy Act of 1992 which encouraged wholesale power competition. The electric utility environment continues to evolve in response to changes driven both by the market and by legislation. Small generation resources are an important component of “smart grid” electric distribution infrastructure, and they are essential elements in defining and designing resilient and secure microgrids to deliver safe, efficient energy even when man-made or natural events disrupt the larger grid. Cogeneration is the sequential generation of electric and useful thermal energy from a single energy source. This is interchangeable with a generally accepted definition of combined heat and power (CHP). Trigeneration, sometimes referred to as combined cooling, heating, and power (CCHP), is considered a subset of cogeneration for this discussion. There are three basic cogeneration cycle configurations: topping cycle, bottoming cycle, and combined cycle. 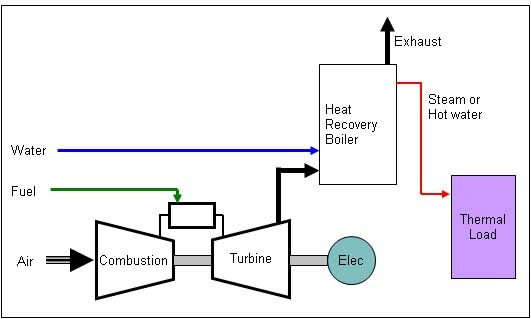 If electricity is generated in the first process and the rejected heat becomes an energy source for a subsequent process (such as heating and cooling a campus), then it is called a topping cycle. Topping cycles are the most common cogeneration cycles employed on college campuses. Schematic diagrams are shown in Figure 1 for three prime movers. Figure 1(a). Cogeneration topping cycle with reciprocating engine prime mover. Figure 1(b). Cogeneration topping cycle with combustion turbine prime mover. Figure 1(c). Cogeneration topping cycle with steam boiler prime mover. If the first process produces rejected heat that is used to generate electricity in the second cycle, then it is called a bottoming cycle. 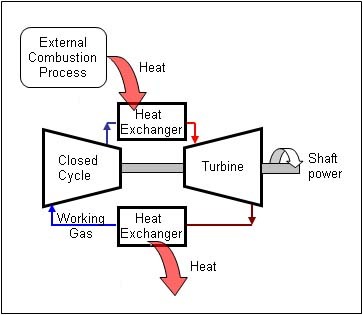 A bottoming cycle usually involves a waste heat recovery boiler that produces steam to drive a turbine generator. A schematic diagram is shown in Figure 2. Figure 2. Cogeneration bottoming cycle. A combined cycle is a combination of a topping and a bottoming cycle. In this case, electricity is produced on both ends of the cycle. 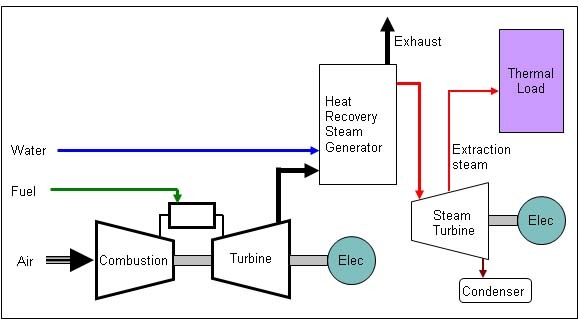 A schematic diagram of a combined cycle using a gas turbine, heat recovery steam generator, and extraction steam turbine is shown in Figure 3. Figure 3. Cogeneration combined cycle. A cogeneration system is a complex, interactive, interdependent system, with numerous primary and secondary variables that can have a significant impact on cost-effective operations. Operating permit conditions or changes in statutory requirements may impose other restrictions. Routine and preventative maintenance activities need advance planning to mitigate and minimize the impacts of downtime. A competent engineering staff knowledgeable about these topics will provide essential support for performance testing, design and implementation of modifications, and long-range planning to ensure successful plant operation. It is imperative that the knowledge developed by the engineering staff during the process that led to the decision to install a cogeneration system be memorialized, and this knowledge should be the basis of training for both engineering and operations staff. Operators should understand how and why the cogeneration system works, as well as how to operate the equipment. Whereas operators may not need an in-depth understanding of all engineering issues, they should have a situational awareness of how the balance of the plant as well as the outside campus reacts to their operating practices. A cogeneration system provides both electric and thermal energy. In general, campus requirements for these two utilities are essentially independent, and the preferred mode of operation will depend on the root justifications for the cogeneration system. This discussion assumes that the generator is connected and synchronized to the electric grid. Starting with the consideration of electric loads, thermal loads, and cogeneration system size, three basic operating scenarios are available. The first is constant full-load operation. If the electric load and thermal load are greater than the cogeneration system capacity, this mode is indicated. The balance of the electric load is served by the grid, while traditional boilers serve the balance of the thermal load. This is typically the most energy- and economically efficient operating condition for the cogeneration system because it maximizes both electric generation and heat recovery. If the electric load is greater than the system capacity and the thermal load is less than the system capacity, then constant full-load operation is the typical mode. The balance of the electric load is served by the grid, while excess thermal capacity is rejected, clearly reducing system efficiency. Depending on the system design, this may be accomplished by bypassing the heat recovery system, venting steam, or dumping the excess recovered heat to an alternate heat sink such as a cooling tower. The other operating option is to follow the thermal load, which reduces the amount of electricity generated and increases grid electric purchases. This operating condition generally sacrifices energy efficiency, and it wastes generation capacity, which is usually the preferred energy output. If the electric load is less than the system capacity and the thermal load is greater than the system capacity, then electric load following is the typical mode. The balance of the thermal load is served by traditional boilers. The other operating option is to follow the thermal load, which generates excess electricity that must be exported to the grid. The electric utility may require special metering and contract agreements for this operating mode. Economic dispatch can be considered if the electric generating capacity is significantly greater than the campus electric load. In this mode, the cogeneration system is operated to generate excess electricity that is sold to the grid when the grid price paid for electricity is favorable. The economic assessment must take into account whether excess heat must be rejected. The electric utility will require special metering and contract agreements for this operating mode. There may also be grid ancillary services such as reactive power and voltage control, frequency control, or synchronized reserve dispatch that the facility may choose to participate in for additional economic value. The cogeneration system consists of a prime mover that consumes input fuel to drive the first process, with equipment to recover waste heat from the first process for use in the second process. For this discussion, electricity generation is the first process, and the prime movers are combustion turbines, reciprocating engines, steam turbines, and fuel cells. A combustion turbine converts the energy of fuel to mechanical energy by combustion to turn an electric generator. It can be used in a closed cycle or an open cycle configuration (Figures 4 and 5). In a closed cycle, the working medium (usually air or helium) is physically isolated from the combustion process, so combustion products and the corrosion and erosion they produce are not present in the turbine. External combustion allows for use of a wide variety of fuels, such as coal and refuse-derived fuel. 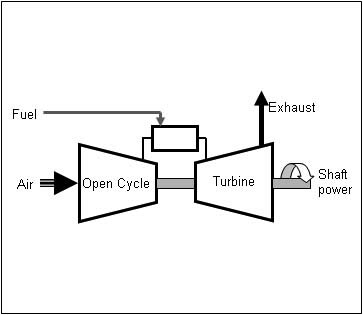 In the open cycle, which is more prevalent, the working medium, air, is compressed and used in the combustion process, and is then used to drive the turbine before exhausting back to the atmosphere. Primary fuel sources for the open cycle are natural gas and fuel oil, although landfill gas and biogas can be viable fuels with proper combustion tuning. Figure 4. Closed cycle gas turbine schematic. Figure 5. Open cycle gas turbine schematic. The electrical efficiency of combustion turbine cogeneration systems varies widely. Unit selection is important because smaller units tend to be less efficient, and even similar-sized units from different manufacturers can perform much differently. Operating conditions can have a larger impact than initial equipment selection because part load operations, dirty filters, and inlet air temperatures warmer than the rated temperature will further degrade efficiencies. A reciprocating engine also converts the energy of fuel to mechanical energy by combustion to turn an electric generator. Primary fuel sources are natural gas and fuel oil. The electrical efficiency of reciprocating engine cogeneration systems can be quite high, and the efficiencies of these systems exhibit less sensitivity to part load operations and inlet air temperatures. A steam turbine uses a closed cycle with water as the working medium. 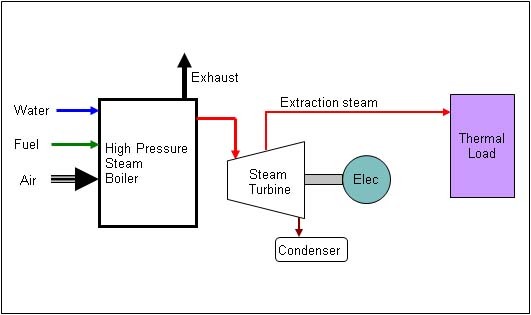 The external combustion occurs in a boiler to produce steam that drives a steam turbine generator. The electrical efficiency of steam turbine cogeneration systems varies widely. Generator sizing has an impact, and even more important are the steam turbine exhaust conditions. A back pressure turbine can provide acceptable efficiencies if all of the steam can be used in the second process. 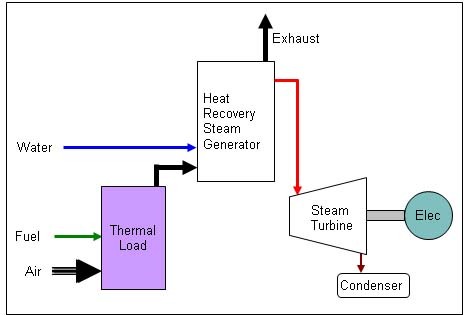 If the steam turbine exhaust goes to a condenser, then the rejected heat is part of the electric energy balance and dramatically reduces electrical efficiency. A fuel cell converts energy of fuel into electricity by a chemical process without combustion. A fuel cell operates like a battery, with a negative electrode, a positive electrode, and an electrolyte. At present, commercially available units use hydrogen or a hydrogen-rich fuel such as natural gas or biogas. Hydrogen is provided to the negative electrode either directly or by using a reformer to purify the fuel. The hydrogen is ionized, and the resulting electrons go through an external circuit that creates the flow of electricity. The hydrogen recombines with oxygen and the returning electrons at the positive electrode, producing water and heat. Fuel cells generate direct current and require an inverter to convert to alternating current. Marketing literature and nominal ratings for cogeneration systems are based on standard test conditions and assumptions that generally allow valid comparisons between products and manufacturers, but these can set unrealistic expectations of performance for installed systems. The following are examples of rating characteristics that need to be considered. Combustion turbine performance is specified at ISO Standard conditions: 15°C, 60 percent relative humidity, sea level air pressure, zero inlet and exhaust losses, and 100 percent power output. Rated power of an installed unit at 15°C may be several percent less than the ISO rating, and the fuel input may be several percent higher. This may not be a penalty if the electric efficiency losses can be offset by increased thermal efficiency. Actual ambient weather conditions will have a noticeable effect on performance. If summer peak electric generation is important, inlet cooling may be an economically justifiable option to ensure generating capacity. Fuel input for combustion turbines and reciprocating engines is based on lower heating value, so a correction must be made when evaluating fuel purchase volumes and costs that are based on higher heating value. The difference between lower heating value and higher heating value varies by fuel. For natural gas, multiply the higher heating value by 0.91 to calculate the lower heating value. For diesel, multiply the higher heating value by 0.937 to calculate the lower heating value. Electric power output is typically quoted at the generator terminals. Parasitic or auxiliary electric loads such as lubricant-circulating pumps, enclosure fans, and controls will consume on the order of 1 percent of the power. Other ancillary equipment also needs to be accounted for in determining the net power that can be supplied to campus loads. This could include gas compressors for supplying fuel at the required pressure, cooling-circuit pumps and fans for heat recovery and heat rejection, and chiller operation if inlet cooling is used. The amount of recoverable heat claimed will depend on the temperature assumptions used, so it is important to understand those assumptions. Reciprocating engines and fuel cells may have separate heat-recovery loops for high-grade and low-grade heat to increase theoretical thermal efficiencies. Lower temperatures allow more heat transfer, but if the thermal load does not support those temperatures, then the recoverable heat is not usable heat, so the installation will not achieve claimed thermal efficiencies. Fuel selection for a cogeneration system will affect the specifications and performance of the equipment. Fuel availability, quality, delivery by pipeline or truck, the need for onsite storage, and the need for backup fuel sources are factors to consider when choosing the primary fuel. Natural gas is a clean-burning, high-quality fuel. It has an extensive distribution pipeline that provides high reliability and availability in most regions of North America. It is generally the preferred primary fuel for a cogeneration installation. If a backup gaseous fuel source is needed, propane is an option that can be metered through an air-propane mixing station as a direct replacement for natural gas. Fuel oil, specifically fuel oil no. 2, is a distillate oil refined from crude that meets quality standards. Although it has limited application as a primary fuel for continuous-duty cogeneration systems, it is widely used as a backup fuel to natural gas in dual-fuel installations. Air permit requirements may restrict the hours of operation on fuel oil to limit emissions of oxides of nitrogen (NOx), carbon monoxide (CO), and various trace elements in the oil that contribute to hazardous air pollutants. Coal is a complex fuel that has a long history of use in closed cycle systems. It has significant emissions issues that discourage its use in new installations. Coal can be gasified to produce a cleaner burning syngas, but this technology is not yet commercially viable. Biogas, digester gas, and landfill gas are alternative/renewable fuels composed primarily of methane and carbon dioxide. They can often be burned directly in atmospheric boilers, but they must be cleaned and have moisture removed so they can be used in pressurized combustion. Even with cleaning, trace elements that contribute to hazardous air pollutants may remain. Gas quantity and quality is site specific and can vary, and using this gas may affect equipment warranties. Equipment tuned for natural gas will work if small quantities of alternative gas are blended in, but combustors tuned to burn these alternative gases will probably not be suitable for natural gas. Biomass is renewable fuel that can be used for direct combustion in closed cycle systems. Biomass quantity and quality are site specific and can vary. Moisture content is a significant consideration, because if the biomass is too wet it may not sustain combustion. Gasification to produce a syngas is an option when close-coupled to fire in atmospheric boilers. The technology is still maturing as different gasification processes and their adaptability to type and quality of the feedstock are investigated. The waste heat recovery system must be designed for the application. Heat recovery to generate steam and hot water are the typical applications. Special applications may use exhaust in direct-contact drying processes, air-to-air heat exchangers, or hot oil heat recovery. Water-to-water heat exchangers are used on engine or fuel cell cooling circuits to recover low-grade heat in the form of hot water. 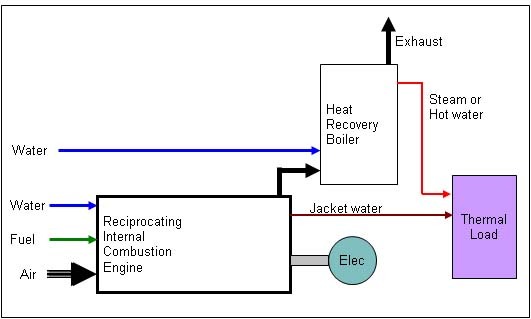 Heat recovery from engine or turbine exhaust uses heat-recovery boilers producing high-temperature hot water or steam. In gas turbine applications, the exhaust contains enough excess air to support additional combustion. This allows for the opportunity to use supplemental firing to obtain additional heat at close to 100 percent recovery of the energy in the supplemental fuel. Supplemental fired heat recovery boilers can be equipped with supply air fans to allow operation when the prime mover is down for maintenance. The specifics of the planned installation may dictate other studies, permits, and agreements that must be completed. Adjacent properties and neighborhoods may raise concerns about noise, viewshed, and traffic flow. This is not intended to be a comprehensive list, but it does illustrate that regulatory matters and public perception are a significant consideration, and they will affect implementation schedules and costs. The following questions need to be addressed early, and revisited as needed in the process of considering a cogeneration system. The responses to these questions may suggest other major points of consideration. As the assessment proceeds, the answers to these questions may change, and thus change the direction or scope of the study. What Are My Reasons for Considering Cogeneration? If specific quantifiable needs are not defined, such as increased reliability, energy cost savings, upgrading aging infrastructure, suitable year round thermal load, or addressing future energy requirements, then the exercise will be a waste of time and money, and the study will collect dust on the shelf. With definition it will be possible to determine if the proposed installation meets stated requirements. Do I Have the Data? This is historical operations data and should include purchased utility energy and costs, generated energy (chilled water, hot water, and steam), O&M labor and materials, subcontracted O&M, capital budgets, operating budgets, and unusual expense items. Higher future costs for some budget items may be acceptable if overall expenditures are reduced, but data is needed to evaluate that potential. If data is not available, additional metering may be needed to collect the information going forward. Utility rates and contracts will also be needed to determine the impact of a cogeneration project. Will the evaluation be performed by in-house engineering staff, will it be subcontracted to a consultant, or will it be provided as an at-risk evaluation by an energy services firm? A preliminary screening effort should be performed in-house to gain some understanding of the potential for cogeneration. Depending on time constraints and level of expertise, at some point it will probably be advisable to enlist outside help. This will be more productive if the screening questions are answered and data is available. The conclusions should be similar regardless of the source, but the particular expertise and biases of the evaluator will influence details of the proposed system. Who Will Be Able to Say Yes? There may be a number of stakeholders who must concur, and their concerns should be addressed, but who is the person who will have to say yes and sign on the dotted line? Knowing what will convince that person to say yes, and what issues will cause dismissal, is essential to implementing a project. Solar photovoltaics and wind turbines are electric generation options that may fit into a renewable energy portfolio if siting conditions are favorable. The diffuse and intermittent nature of the energy sources means these alternatives should be considered as supplementing rather than replacing the electric grid or fuel-fired cogeneration. Photovoltaic (PV) cells generate electricity from light. PV cells are made of semiconductor materials, the most common being silicon. There are three types of silicon cells based on the cell structure: monocrystalline, polycrystalline, and amorphous silicon. Monocrystalline cells are the most expensive to manufacture, and they have the highest efficiency for converting solar energy to electricity, 15 percent to 20 percent for currently available panels. Polycrystalline cells are a good compromise between cost and efficiency; 13 percent to 16 percent efficiencies are typical. Amorphous silicon has no crystalline structure so it has low manufacturing costs and the versatility to be applied as a thin semiconductor film on different materials, but its efficiency is very low at 6 percent to 8 percent. For thin film panels there are two other commercially available types: cadmium telluride (CdTe) and copper indium gallium selenide (CIS/CIGS). While the efficiencies of these two approach the efficiency of polycrystalline cells, they use cadmium which is highly toxic. Research and development continues on all PV technologies, with the expectation that efficiencies will increase and life cycle costs will decrease. Most practical solar PV applications are developed using rigid flat panel assemblies of mono- or polycrystalline cells. Mounting arrangements are fixed-array, single-axis tracking, and dual-axis tracking. Tracking may be active or passive. Active tracking uses motors and gear trains to precisely orient the array in response to a controller connected to photosensors. In a passive tracking mechanism, solar heating of a low-boiling-point fluid drives liquid to one side of the mechanism, causing the tracker to move in response to the weight imbalance. Manufacturers provide solar panel ratings at STC, or standard test conditions, which are 1,000 W/m2 plane-of-array irradiance, 25°C solar cell temperature, and 1.5 air mass (which defines standard terrestrial solar spectral irradiance distributions). Another rating may be provided at PVUSA Test Conditions (PTC), which are 1000 W/m2 plane-of-array irradiance, 1.5 air mass, 20°C ambient temperature at 10 m above ground level, and wind speed of 1 m/s. The solar cell temperature is higher for PTC, and that results in a lower power rating. PV cells generate direct current electricity, and power ratings are given in terms of DC watts. Inverters are used to convert to alternating current, so inverter losses must be accounted for in estimating electrical production from a proposed system. Module mismatch, wire losses, and other factors combine to further reduce output. Overall, the peak AC output rating for an actual installation will be about 75 percent to 80 percent of the DC rating. Operation of a solar PV system is automatic, although operators will need to be alert for inverter malfunctions and binding of tracking mechanisms. Typical annual O&M activities include inspection and cleaning of the panels. Tracking arrays will require calibration and adjustment of sensors and actuators. Fixed arrays are usually tilted to orient better with the general angle of the sun to maximize year-round performance. A single-axis tracking array follows the sun from east to west and will generate about 25 percent more energy than a fixed array. Dual-axis tracking will generate about 10 percent more than a single-axis tracking system that by keeping the tilt aligned with the angle of the sun as it varies through the year. Using a tracking system will reduce the number of arrays that can be located in a given area because of the need to minimize shading of adjacent arrays. The array output will be affected by actual weather conditions and timeliness of corrective responses to maintenance issues. Assuming standard practices are applied to the design of the installation, programs are available to estimate electricity production. PVWatts™, a free online calculator developed by the National Renewable Energy Laboratory, is a relatively easy and quick to use tool that provides credible estimates of annual power production. Wind turbines convert the kinetic energy in the wind to mechanical energy to drive an electric generator. They can be separated into two types based on the rotation axis, vertical or horizontal. Vertical axis turbines have some applications for residential-scale installations, but horizontal axis turbines are the predominant type for commercial-scale power generation. Horizontal axis turbines mount the main rotor shaft and electrical generator at the top of a tower, and the blades face into the wind. Larger wind turbines use wind sensors and servomotors to point the turbine, and the blades have variable pitch control to extract more energy over a wider range of wind speeds. The Department of Energy's (DOE’s) National Renewable Energy Laboratory uses wind power density to characterize wind resource potential on a scale from 1 to 7. 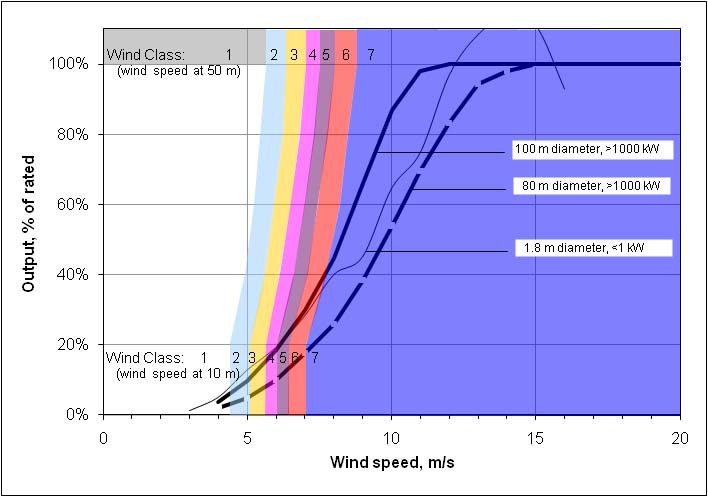 For each class, wind speed increases by about 25 percent and the power density doubles between 10 m (33 ft) and 50 m (164 ft) above surface level, the two elevations commonly given. Table 1 lists wind power class characteristics at 50 m.
Class 3 is generally considered the minimum suitable for grid-connected wind turbine applications. Local terrain and obstructions, including other wind turbines in a multiple-unit installation, will significantly affect wind characteristics. Vegetation and structures will create downwind turbulence that will degrade turbine performance. Therefore, site-specific data will need to be gathered and evaluated to develop a realistic expectation of power generation potential for any installation location. Certification for wind turbines is obtained through compliance with the International Electrotechnical Commission (IEC) standard 61400. However, performance curves and annual output estimates can vary significantly between individual units with the same power rating depending on numerous parameters, including rotational speed, gearing, tower height, and blade swept diameter. These same parameters also affect cut-in (or starting) wind speed, cut-out (or stopping) wind speed, survival wind speed, noise, and weight. Cut-in wind speeds are typically about 4 m/s (8.9 mph), whereas typical cut-out wind speeds are 20 m/s (44.7 mph) to 25 m/s (55.9 mph). Figure 6 presents typical wind turbine performance curves expressed as percentage of rated output. The wind class is also illustrated from 10 m (33 ft) to 50 m (164 ft) above surface level. All sizes will follow similar curves because power is proportional to the cube of wind speed. It is clear from the figure that the wind speed at which the turbine is rated will have a dramatic impact on annual production. Figure 6. Typical wind turbine performance. The primary operations objective is to keep the wind turbine components up and available so that the wind turbines are running when the wind is blowing. Wind turbines contain a variety of complex systems that must all function correctly. In normal conditions the turbine controller enables automatic operation, but the failure or malfunction of even a minor component can shut down the turbine. Accessing and working on the components imposes special considerations given that most of the turbine equipment is in the tower. A proper O&M plan executed by qualified, motivated technicians is essential. The plan should be based on specific O&M tasks and their frequency as defined by the turbine manufacturer. These tasks will include equipment inspections, blade cleaning, oil and filter changes, calibration and adjustment of sensors and actuators, and replacement of brake pads and seals. Regulatory requirements for wind turbine installations vary dramatically. Some political subdivisions have a formal permitting process that includes analysis of the potential environmental impacts and proposed mitigation measures. Other areas have no special requirements. If the project location has the potential to affect protected wildlife and wildlife habitat, project permitting may involve the U.S. Fish and Wildlife Service and state wildlife agencies. Federal Aviation Administration approval is needed for structures more than 200 feet tall or close to airports. The business case is quantifying the economics in a financial model so that a sound financial decision can be made. Determining the true costs of ownership and the sensitivity to major variables will allow financial risks to be identified and planned for. The knowledge will be useful to negotiate contracts with fuel and utility suppliers, whether or not a cogeneration system is installed. If current economics are not acceptable, the financial model can be the basis for reconsidering should the major variables change. If an installation is supported, the financial model should be the basis for monitoring performance and making strategic decisions about operations management in the future to extract the maximum benefit from the installation. The economic analysis for photovoltaics and wind turbines is simplified because these projects only generate electricity; therefore, all financial elements accrue to valuing the cost per kWh. Cogeneration outputs are electric and thermal utilities, so an allocation of costs to each output is needed for informed decision making. Quantifying the value of electricity and of heat recovery starts with quantifying the input fuel stream and three energy output streams—electricity, recovered useful heat, and waste heat. This immediately becomes more complicated because the proportion of each output stream may vary depending on the planned operating methodology. Values representative of an average system load are useful for cost allocations and will allow meaningful comparisons to existing utility costs. The waste heat stream can be split between the other two by a variety of methods. The allocation may be driven by a need to demonstrate a cost of cogeneration electricity that is lower than the purchased electric utility rate. Alternatively, the waste heat stream can be divided equally, or it can be allocated by proportion of electricity output to the total useful output and recovered useful heat to the total useful output. Besides the cost of fuel, the O&M costs of the system should be included in valuing electricity and thermal production. Full-service contract costs are a good estimate of the value to apply. For initial screening, the expendables and O&M service contracts can be estimated as $0.02/kWh times the total kWh/y that the generator would produce at 100 percent power with no downtime. Allocating these costs using the same methodology as for fuel is a reasonable approach, but is somewhat arbitrary. If selling electricity to the grid is contemplated, it is recommended that a separate value for that excess electricity be calculated based on system operation for an incremental increase in power. If the thermal loads cannot use the additional heat available for recovery, the incremental cost of generating additional electricity bears the full cost of fuel. Variable O&M costs that are related to how much power is generated should also be included. However, fixed costs such as financing costs, operator labor, and general overhead need not be included in calculating the incremental value of excess electricity sold to the grid. The final element of the evaluation is an assessment of risks, balancing those that apply to the proposed project against those that apply to any alternatives, including the case that no project is implemented. The following are common risks to consider. Capital cost risk typically involves completeness of project scope, unexpected conditions that may require mitigation or expanded scope of work, and construction delays. Technology risk can be attributed either to new technology/new application or to obsolescent technology superseded by evolutionary improvements. Fuel source risk applies to alternate fuels that pose higher risk for long-term availability, cost, and quality, with derivative risks on performance and emissions for fuel-consuming equipment. Future cost risk for utilities and fuel is a risk that is both regional and global. Utility infrastructure capacities and changes in regional use will have an effect, as will changes in national legislation and foreign markets. Short-term volatility of commodity prices can upset decisions based on long-term market trends. Maintenance and operations risks are associated with new equipment, activities to maximize system availability, staff training, and operating procedures. Operations risk also depends on the sensitivity to the spark spread, which is the cost to purchase electricity compared with the cost to generate it. The project risk elements listed above overlap and interact. When the potential financial impact of a particular risk changes dramatically because of the project, including a contingency fund or making material changes in the project may be appropriate risk-mitigating strategies. Evaluating the potential benefits and risks of a cogeneration system requires a significant amount of data and effort, whether the evaluation is performed with in-house staff, hired out to a consultant, or requested as a proposal from a vendor, energy services company, or design-build firm. It is important to understand the data and how to interpret it, even if the detailed analysis is performed by others. The better you know your systems, the more likely it is that you will get an installation that meets your needs and expectations. The data collection and analysis process can and will have spin-off benefits for plant operation, and it should be continued regardless of the results of the cogeneration evaluation. A cogeneration system represents a significant and long-term investment in equipment and staff. Because it is a source for both electric and thermal energy, it can enhance the reliability of utility services and offer economic advantages for supplying campus energy needs. A knowledgeable staff of engineers and operators is essential to realizing these advantages, along with an operating plan that addresses both day-to-day and long-term considerations.